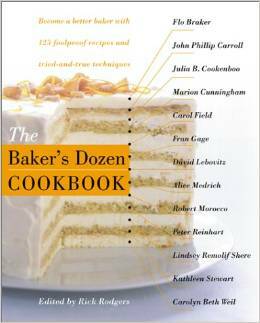 We invite you to bake one of a few selected recipes from The Baker’s Dozen Cookbook. Then join us for a tasting followed by a spirited discussion moderated by our President, Nancy Kux. Whether you follow the recipe to the letter or take a few creative liberties, please jot down the specific ingredients you used and any modifications you made to the recipe so that we may compare results. Note cards will be provided for this purpose at the restaurant. For those of you who don't own the cookbook, look for very affordable used versions on Amazon or you can click on the title below for the recipe. Sibby Thomsen chose these recipes for the day. I don’t know how she could narrow it down! Looking through our Bakers Dozen Cookbook is to marvel at the selection. The recipes are carefully written, well tested and reflect our collective wisdom. There are mostly sweet based recipes but there are some very interesting savory ones too. Go back and look at these recipes and share them again with your family and friends. Just recently a friend baked a lemon meringue pie which wept. She asked me why. With confidence I sent her Carolyn Weil and Kathleen Stewart’s instructions and advice (pages 140-143). We wrote our book to encourage baking using good recipes and helpful tips. As always, afterwards, we will enjoy a delicious lunch prepared by Foreign Cinema.